BEIJING, March 10 -- President Xi Jinping on Sunday afternoon joined deliberation with deputies from Fujian Province at the second session of the 13th National People's Congress, China's national legislature. "[We] should create a favorable development environment for innovation, entrepreneurship and creativity," said Xi, also general secretary of the Communist Party of China Central Committee and chairman of the Central Military Commission. China should seek momentum from reform and opening up, unleash to the maximum the whole society's power for innovation, entrepreneurship and creativity, and keep improving the country's influence and competitiveness in a world that is undergoing profound changes, Xi said. Xi stressed creating favorable conditions for the development of small and medium-sized enterprises and young people, and establishing an acceleration mechanism for high-tech companies. He urged solid implementation of the policies and measures to encourage, guide and support the development of the private sector. Fujian must leverage the combined strengths of the special economic zone, pilot free trade zone, comprehensive experimental zone and the core zone of the 21st Century Maritime Silk Road, and keep exploring new approaches, Xi said. Xi called for efforts to explore new ways for integrated development across the Taiwan Strait. The two sides of the Taiwan Strait should enhance economic and trade cooperation, infrastructure connectivity, energy and resource exchanges, and shared industry standards, he said. Cross-Strait cooperation and cultural exchanges should be strengthened, he added. Xi stressed the importance of implementing the people-centered development concept in the work on Taiwan, urging efforts to benefit Taiwan compatriots in the same way as people on the mainland are served. He encouraged listening to the voice of Taiwan compatriots and research on what other policies and measures can be introduced to bring them benefits. Xi said that this year marks the 70th anniversary of the founding of New China, and it is necessary to ensure that no one in the country's old revolutionary base areas falls behind in the process of building a moderately prosperous society in all respects. He called for adherence to targeted poverty alleviation and efforts to identify the root causes of poverty to enhance the effectiveness of anti-poverty measures. More efforts should be put into coordinating economic development with ecological protection, Xi said. 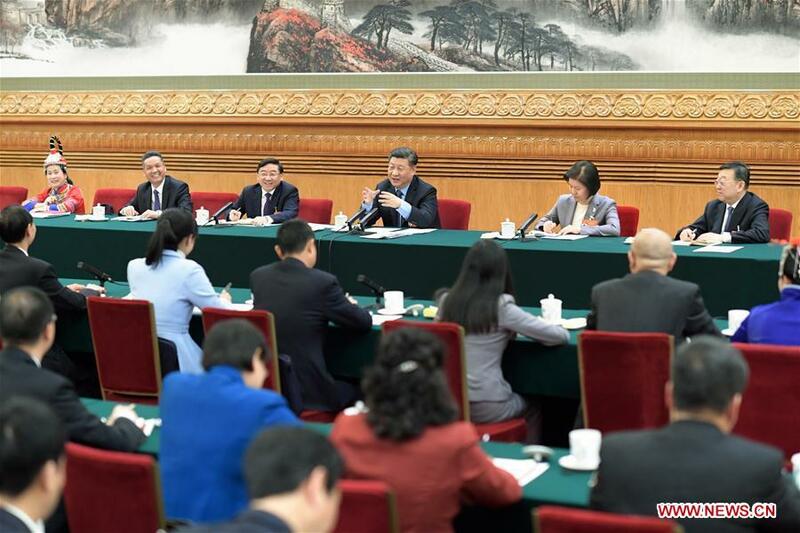 Li Zhanshu, Wang Yang, Wang Huning and Zhao Leji, all members of the Standing Committee of the Political Bureau of the CPC Central Committee, also joined deliberations with different delegations. Li, chairman of the NPC Standing Committee, said formulating the foreign investment law is a major legislative task set by the CPC Central Committee with Comrade Xi Jinping at the core. Deliberating with the delegation from Jiangsu Province, Li said the legislation is conducive to creating a first-class business environment that is market-oriented, law-based and international, providing an even stronger legal guarantee for high-level opening up. Deliberating with the delegation from Tibet Autonomous Region, Wang Yang, chairman of the National Committee of the Chinese People's Political Consultative Conference, called for efforts to further maintain law and order, improve the quality of poverty alleviation work, guarantee stability and peace of the plateau region, and ensure that people of all ethnic groups live and work in contentment. Wang Huning, a member of the Secretariat of the CPC Central Committee, underlined the overarching goal of social stability and enduring peace in Xinjiang Uygur Autonomous Region when he joined the delegation from the region for deliberation. He required earnest efforts to safeguard and improve people's wellbeing. Joining the delegation from Hainan Province, Zhao Leji, secretary of the CPC Central Commission for Discipline Inspection, called on efforts to accelerate developing the pilot free trade zone and explore building the free trade port with Chinese characteristics. He also demanded improving Party and state oversight systems to make sure various tasks are well implemented. Various folk activities held across China to mark "Er Yue Er"